Hole flanges are commonly manufactured in mass production by conventional press-working. In an industrial context, the process limits are usually evaluated by means of the Limiting Forming Ratio (LFR), which defines the maximum attainable diameter of the flange related to the initial pre-cut hole. Nevertheless, the LFR does not provide enough information about material deformation, thickness distribution or the expected onset and type of failure. In this sense, a systematic investigation using the Forming Limit Diagram (FLD) is needed. Under these circumstances, the aim of this work is to provide a better understanding of the deformation process in conventional hole flanging, analysing the effect of the punch edge radius as well as the influence of the strain distribution along the hole flange on formability. An experimental campaign on 1.6 mm thickness AA7075 annealed sheet was completed using cylindrical punches with different profile radii. In addition, numerical modelling of the process using finite elements was developed. 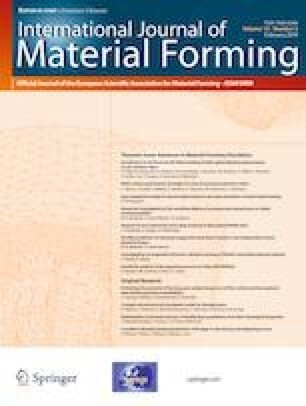 The results allow better understanding of the physical mechanisms governing material deformation and process formability in very ductile materials. In this regard, this research work contributes to the current state of the art in conventional hole flanging by establishing the modes of failure that prevail in the process and the influence of the bending induced by the tool radius in the flange formability. In addition, the limitations of using conventional FLD for providing a limiting threshold for the strain states attained in the flanges deformed with different punch profiles are also identified. This research was funded by the Spanish Government throughout research project DPI2015–64047-R.
M. Borrego has received research grant BES-2013-063796 from Spanish Government. The rest of authors declare that they have no conflict of interest.